important contacts, and other helpful information. Ogeechee Technical College provides veterans’ educational benefits to service members and their families and enrolled almost 100 veterans last year alone. Ogeechee Technical College evaluates the Joint Service Transcript (JST) for military experience and training for possible credits. With more than 100 degree, diploma and certificate programs, Ogeechee Technical College has the education and training that’s right for you. You can also quickly expand your career skills or gain professional certification through our Business and Industry, and/or Continuing Education courses. Colleges and universities throughout the nation accept transfer credit from Ogeechee Tech. In many cases, you can complete the equivalent of the first two years of a four-year college degree – at a fraction of the cost. You’re not just a number on our campus. You’ll get one-on-one attention in a career focused learning environment. 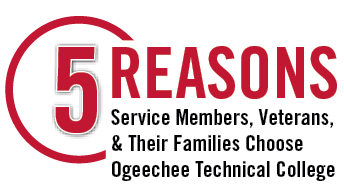 Ogeechee Technical College is approved for veterans’ educational assistance and maintains trained staff members to assist in your educational journey. You’ll find caring faculty and staff members whose mission is to help you reach your goals. Most Ogeechee Tech students fit their education in with other responsibilities, including families and jobs. With a choice of day or evening programs, distance learning opportunities, and hybrid courses, Ogeechee Technical College makes getting an education convenient.